Get The Internet Access You Deserve! GigaBeam Networks offers broadband Internet speeds faster than outdated phone company DSL, and comparable to cable with no data caps. Our 4G network supports speeds up to 100Mbps and our NEW (under construction!) 5G network supports speeds up to 1Gbps! Welcome Whitesburg, Kentucky to the GigaBeam Family! GigaBeam Networks in partnership with FiSci Technologies looks forward to providing the best in service and support to the Whitesburg community! GigaBeam Networks is deploying next generation wireless equipment capable of speeds excess of 1Gbps! (1024Mbps!). Our newest 4G plans will have speeds between 10 to 100Mbps and 5G plans between 100 and 1000Mbps. All from the ONLY LOCAL ISP in our coverage area! All our plans include local service and support, no data caps, and an everyday low price that never increases or changes. We also guarantee no extra or hidden fees, ever. Cable companies are going to data capped service. They only offer unlimited data when paying for their premium tiers (Their cheaper tiers are limited to around 12 hours of usage per month, after that you pay overage fees). All GigaBeam Broadband packages are data cap free. Unlimited access, no matter what plan you choose. GigaBeam Networks and WVVA.net Inc offer a wide range of products and services. Our 4th gen network offers speeds up to 50Mbps (Soon up to 100Mbps!) and now we're building our first 5G network with speeds up to 1Gbps! Customized and enhanced Internet access for mission critical business applications with speeds up to 1Gbps. WVVA.net Inc specializes in all your business IT needs including server maintenance, network design and workstation support. GigaBeam Networks serves several counties in southern West Virginia as well as southwestern Virginia including Giles, Monroe, Mercer, Bland, Wythe, and Tazewell. We are constantly expanding and are planning other counties this year. 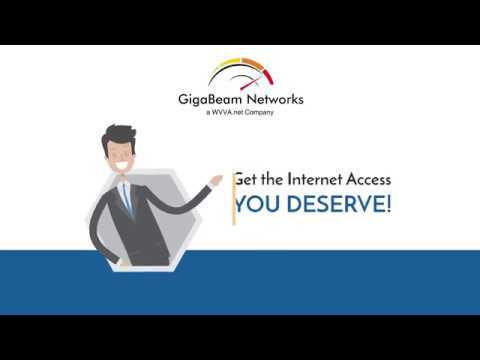 What is GigaBeam Networks Broadband Internet Access? Signup to receive all the latest news from GigaBeam Networks.